Finally, after determining I’d read 100 books this year, I finished the first one today. 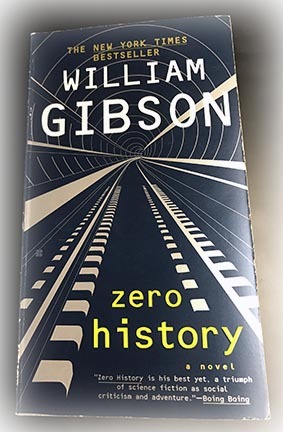 After picking it up off and on since late summer, I polished off William Gibson’s Zero History. Yes, it’s a hard copy, as virtually all of my books are. I stare at a screen all day for work; for leisure, I turn it away. This book is the sixth of his I’ve read, closing out a trilogy with Pattern Recognition and Spook Country. I’ve seen this set called more accessible, as it is set in roughly contemporary time, but I find I’m pleased to have started with the much more challenging Neuromancer and the rest of the Sprawl trilogy. If I hadn’t been exposed to all that glorious weirdness, struggling to wrap my head around a few things, I wouldn’t have gone so all in on the rest of his work. That said, while I have four more of his books on my shelf, I’ll be taking a break. There’s some dystopia and horror calling, and even a bit of poetry.